Many of you may not care about the play-offs, or may not even notice, but I imagine that among you a few others, like myself, will be glued to the TV for the next few weekends. I've been a football junkie for a long, long time. For the non-addicted, football may be confusing and hard to follow, but for those who get into it, the subtleties and the complexity of the game continue to enchant. Football (i.e. American football) resembles a giant chess game with opposing players (coaches) directing their forces just as chess players move their pieces, each of which has a different function, size, speed, and movement. It's also reminiscent of how the Army was described back when I was there in the days of the draft: an organization, designed by geniuses to function effectively when run by idiots. Football players are not idiots but they don't need to be intellectuals either. The coaches, if they're to be successful, need to be considerably more clever than their post-game interviews would ever lead you to believe they are. Pro football players have survived what may be the most selective, competitive process in the world, far more selective than any Olympic trials. They've had to stand out on their high school teams to get into college programs where they've competed with thousands of other college players just to get a chance to compete for one of about 70 places (54 on game day) on one of the 32 pro teams. 224 players are selected in the annual NFL draft and a few dozen undrafted players manage to get tryouts. After being signed, when they don't perform up to the level expected of them, they're unceremoniously cut. If our presidents, senators, congressmen and bank presidents had to survive a similar screening, the country would probably be in better shape. Still, football is as much of a lottery economy as the general economy has become. For every NFL star making millions of dollars, there are thousands of players, almost but not quite as good, who give their all to their alma mater, working full time at the sport for three to five years and often often not even getting a degree to show for it. The players' sense of entitlement is far more reasonable than that of typical lottery winners and most express gratitude for their opportunity to compete. A few, whose ego/intellect quotient exceeds the norm, find ways to get themselves in trouble with the law or with the league's substance abuse regulations. While there have been many occasions of DUI arrests of players, it's hard to recall instances of players using their celebrity status to speak out on issues that might offend their team owners. In recent years the packaging and promotion of the game have grown. More people watch pro football and ever more money is involved. The growing industry has spawned a legion of pseudo employees who work on the periphery, from the assistant coaches (about one for every two or three players) to the ever larger number of ex-players who cover the games on TV, to the “journalists” who report on the teams. The “journalists” are little more than press agents who inflate the importance of every game and the unique skills of the players, all of whom, as in Lake Wobegon, are far better than average. Their interviews invariably consist of questions such as “How does it feel to have scored that touchdown?” or “What does it mean to you to be playing your former team?” The players and coaches, some of the country's youngest millionaires, do their best in enduring these interviews, which may be the most tedious parts of their jobs. Team owners mostly fall into two categories. Some have been born into it, i.e. they've inherited their teams from fathers or grandfathers who got in at the beginning. Others are self-made billionaires whose trophy wives just aren't enough to boost their already gargantuan egos so they had to go out and buy themselves a team. The oligarch owners, never content with the vast cash flow they receive from TV revenues and ticket sales, extort public funds for lavish new stadiums by threatening to move their teams to other cities willing to give them even more money and tax breaks. The new stadiums tend to feature lavish boxes for those who can afford their stratospheric prices or write them off as business tax deductions. Stadiums built for the Dallas and New York teams recently have each cost more than $1 billion. The NFL, and now the NCAA too, gets its vast revenues from TV. Since more people watch TV in the evening than in the afternoon, more and more games are scheduled at night, even in December, and January. Works OK in Miami and and in San Diego, but for every Tampa Bay in the league, there are several Cincinnatis and Chicagos. Screw the fans! If they're dumb enough to pay to sit in those conditions, they're morons, and most likely drunken morons, anyway. The “journalists” keep brainwashing the public with stories about how it's definitive football when the weather turns really nasty, and sure enough, thousands of the sheep-like fans appear to be numb enough to go along. Inevitably, numbers of them show up at sub-freezing game sites exposing their painted faces and bare beer bellies to the gaze of the TV cameras. What about the players, don't they complain? Not much. Few want to bite the hand that feeds them so well after all the effort they've made to get there. 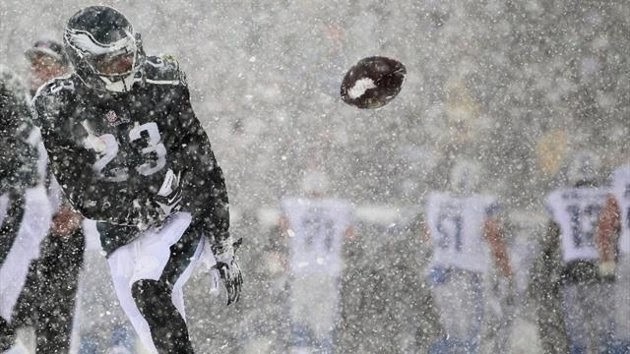 It's hard to generate much sympathy for young men who can get a million dollars or more to play a game lasting about three hours, even if the conditions are barbaric. The actual action in these games takes about 40-45 minutes, and the defensive and offensive squads split that time. TV, being the paymaster, requires frequent commercial breaks so every few minutes, sweating 300 pound men must stand around on the frozen field in sub-zero nighttime temperatures for two and a half minutes until the whistle signals the end of the commercials. The chilled public gets to be entertained and/or numbed in these intervals by high volume non-musical music. 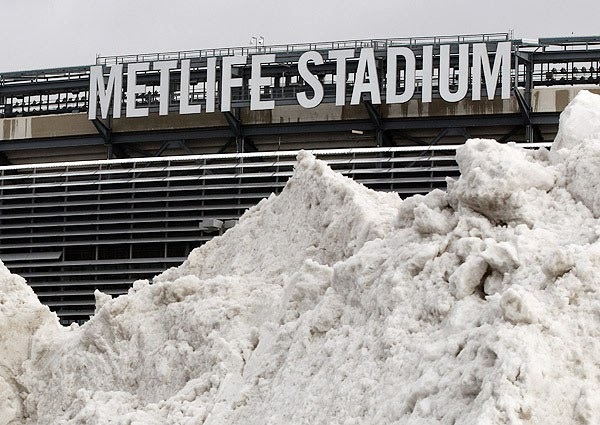 This year's Super Bowl will be played in the new Giants-Jets stadium in East Rutherford, New Jersey, where the temperature is about 17°F as I write and there is something like 7 inches of snow on the ground. What a treat for the players to make it to the biggest game in football, the apex of their athletic careers! These players are competitors by definition and I suppose the competitive fires burn brightly in some, but who could blame a veteran making five or eight million dollars a year if he's just as content to end his season without having to go through the agony of the play-offs. As I've said, football is a great sport and the players are splendid athletes. Shouldn't they be able to compete in in an environment that allows them to play at their highest level? No? Then how about rescheduling Wimbledon to January and letting Roger Federer and Raf Nadal battle for the title on a snow covered court, or running a Nascar race in a tornado? I'm sure that these and other similar maneuvers could really give ratings a boost! A backlash is coming. 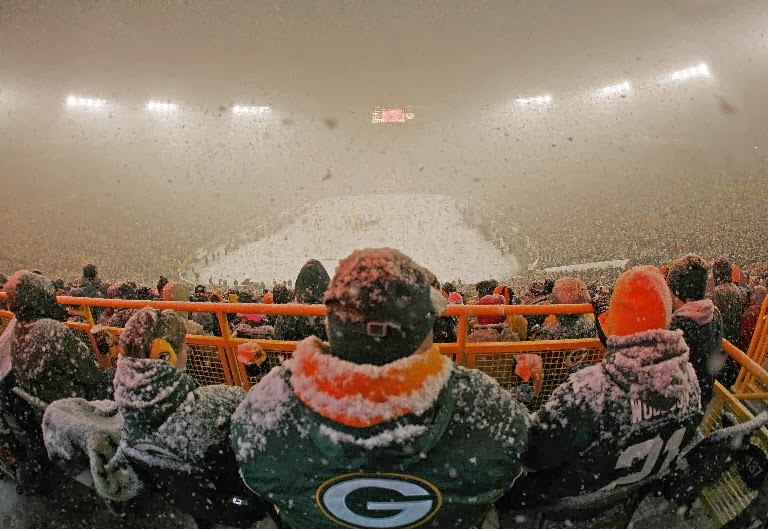 Tickets are not selling out for play-off games in Green Bay, Cincinnati and Indianapolis, with the attendant threat of TV blackouts for the home audience. Some people have apparently come to the conclusion that watching the game at home beats paying $100 to $300 (or much more on the black market for sold out games) to sit outside in a nighttime blizzard for three and a half hours. 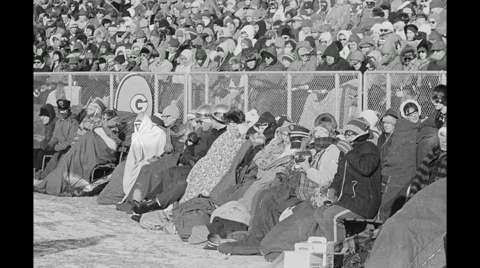 It is not all that remarkable in this time of deep recession and high unemployment, that there are not 70,000 cheeseheads both willing and able to afford to be out there. We wish you a happy new year and that your area will not be subject to blackout.